Fireworks, blackberrying, Doctor Who, saints feet, spring tides, James Bond, pantomimes  all and more have inspired the prayers within this new book. Food for Prayer offers an imaginative prayer suggestion for every day of the year, rejoicing in the fact that the ordinary stuff of life can be food for prayer. It will encourage those who are new to prayer and stimulate others who would like to pray more regularly. It follows the changing seasons and the Churchs cycle of feasts and festivals so that whenever we begin, prayer may find its place in the rhythm of our days. Claire Benton-Evans wrote her first prayers at the age of eight and read English at Oxford before teaching in London and North Devon. She is currently working with church groups to devise fresh, dynamic worship for all ages; this has developed her interest in creative approaches to prayer and praise. 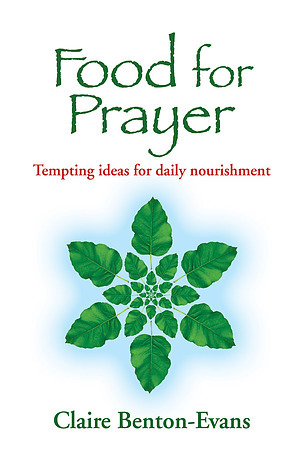 Food For Prayer by Claire Benton-Evans was published by Kevin Mayhew in December 2008 and is our 29615th best seller. The ISBN for Food For Prayer is 9781848671041. If you feel the need for input to refresh and revive your prayer life, then I commend this book to you. Claire Benton-Evans has brought together a very helpful collection of brief readings and prayers, one for every day of the year – so you can pick it up and start using it at any time – plus a few extras for special occasions and festivals. These suggestions are ‘unashamedly eclectic’ (as the author puts it), drawn from such varied sources as the Bible, hymns and blessings, poetry (from R. S. Thomas to Pam Ayres!) and films (from ‘O Brother, where art thou?’ to ‘Spiderman’!). They are grouped by common themes, for example sensory prayer, the acronym ACTS, prayer directions, ‘back to school’, footprints, the body, weddings and ‘angels and devils’. And there’s so much more! I reckon this volume is a good investment. Got a question? No problem! Just click here to ask us about Food For Prayer.